Sometimes, by August, I just don't have the energy to cook when I get home. So I have done what many bloggers have done. I jumped on the tartine bandwagon. 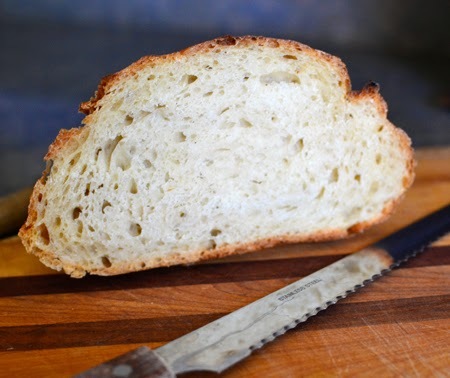 Before blogging, I had never heard of a tartine. Is this some made up marketing scheme like Haagen Dazs or Frusen Glädjé? Did someone think that this sounded French and then say, "Let's write about it and make them famous?" 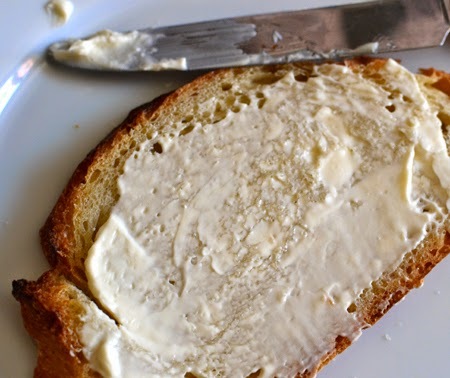 I checked my French dictionary and it said that a tartine is a slice of bread spread with butter. But, from what I have read online, it has come a long way since that simple slathered slice. Nowadays, the word tartine is used in France to refer to an open-faced sandwich, not that the French invented the open-face sandwich. Open sandwiches are served in Denmark, Norway, Sweden, Austria, Germany, the Czech Republic, Hungary, the Netherlands, Poland, Estonia, the Netherlands, Russia, Poland, Lithuania, Latvia, Australia, New Zealand, the United States, and probably in every other country, as well. So, one evening this week, I got home from work and just didn't have it in me to heat up the stove, spend an hour chopping and mincing, or stand in the oven-like outdoor heat grilling. That night I wanted something simple. Thus, the tartine version of my favorite summer cucumber sandwich. Simple. Unadorned. Incredibly good. 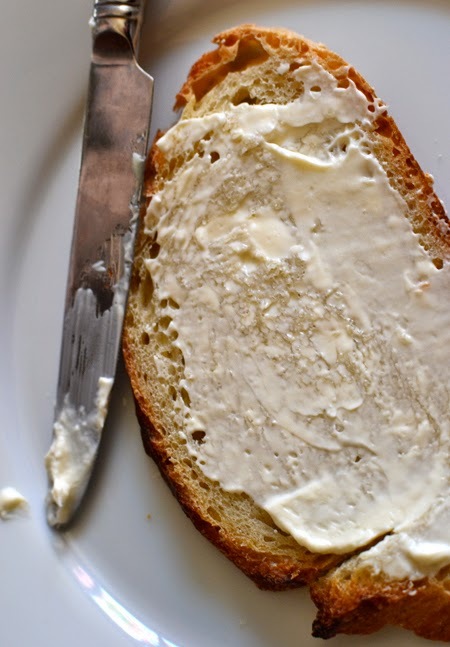 Slather the slices of bread with an ample sufficiency of mayonnaise. 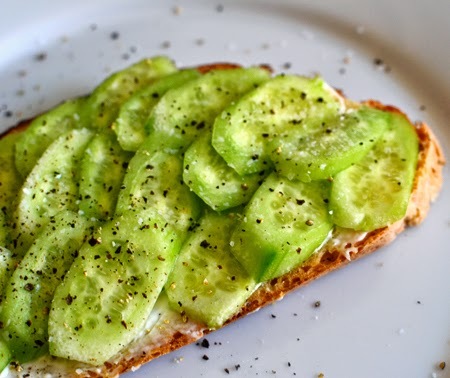 Layer slices of cucumber on top, as if shingling a roof, sprinkle with salt and lots of freshly ground black pepper, and serve. 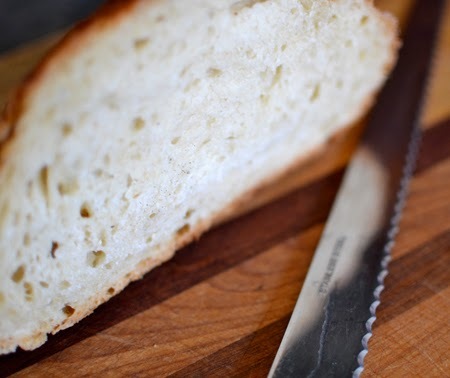 * If you want to make your tartine a little more special, use homemade mayonnaise. 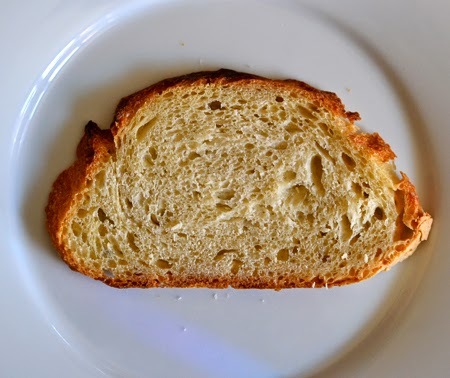 I have posted a recipe for saffron mayonnaise, and all you need to do is eliminate the saffron and you will have wonderful, plain mayo. That is the perfect way to put it, Ahu! We had open-faced beef sandwiches the other night after roasting a tri-tip as Greg did on Sippity Sup. (Great recipe, by the way - came out perfectly!) It was so nice to have something simple at the ready! 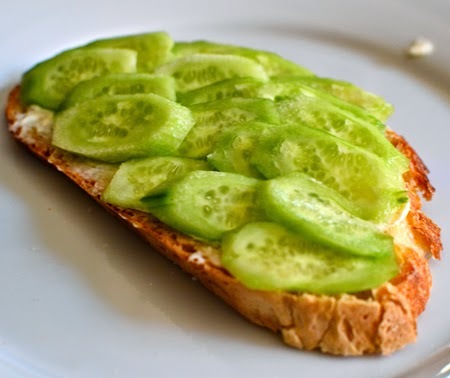 Is there a Persian version of an open-faced sandwich? Liz - we are past the halfway point now and your warmth (and stone fruits and fresh veggies) is on its way! 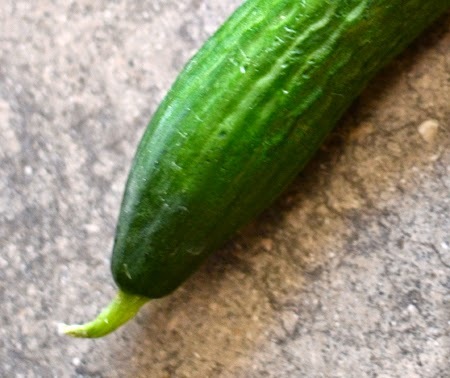 I have to imagine that the Lebanese cucumbers are probably the same! Beautiful. And fascinating! I've never heard of Persian cucumbers! Mimi - they look like small English (or hothouse) cucumbers, and they are very sweet and have minimal seeds. Trader Joe sells them, as do many of the larger chain stores. Thanks fro your nice comment! i really craving this kind of healthy refreshing and quicky dish now! While you crave this, I am totally craving all the great things on your blog, Dedy! Thanks for your comment! So simple! 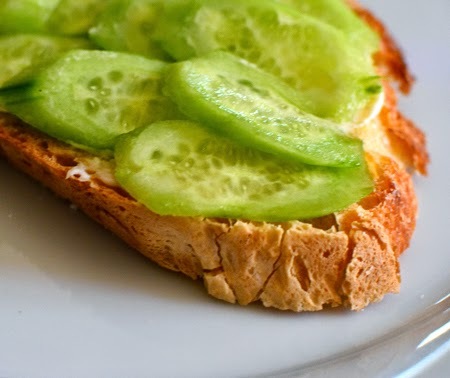 Perfect for hot summer days when cucumbers are abundant! That is exactly it, Susan - in fact, we may have them again today for lunch! I just told friends that a really well made herb butter would be just the ticket for this sandwich, as she doesn't eat mayo either. Crunch away! Hi David, love the simplicity of this dish, perfect for those Arizona summer days! Simple, refreshing and satisfying. That's all that matters, right? Sometimes I cut a fresh cucumber in half, sprinkle it with salt and just crunch right into it. 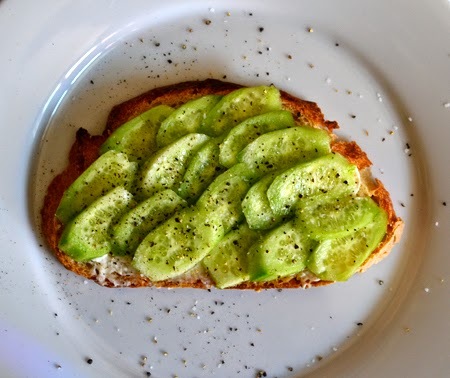 I usually cut one cucumber for the sandwich, and one addition for me to snack on (with good sea salt, of course) while I make the sandwich. All good questions, Greg. So, yes. Yes. Yes. Yes. Yes. And, I'm not sure. Yummm, the photos made me drool! We have something similar in Italy too. In Tuscany, for instance, crostini di fegatini (toasted slices of bread with liver patè) are typically served as a starter. And everyone, of course, knows brushetta, a poor relative of the French tartine! That is true! I never think of crostini or bruschetta as open-faced sandwiches but they really are! The fegatini are my favorites!